Quite simply put: using out of character knowledge to make in-game decisions. 1) Just because you've read the Monster Manual over 9,000 times *crushes scouter* and know the Beholder's stats like the back of your hand doesn't mean your character knows anything about Beholders. 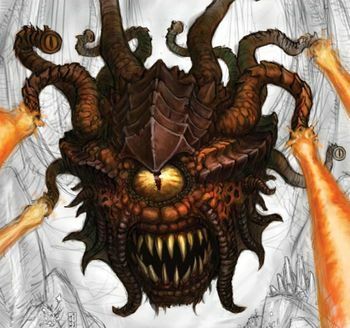 In fact, if you're "that guy" then the DM should make sure your character doesn't even know that they're called Beholders, much less that they shoot beams out of their eyes, and definitely not letting you know how they poop... Actually, does anyone know how that works? 2) An NPC and another character are talking alone somewhere and for the sake of discussion, we're going to say this player character is your bud Rufus. Rufus returns to the group to relay the message but he leaves a very important piece of information out. Your character shouldn't start pestering Rufus as if you're trying to squeeze more information out of him. As far as your character knows, that's all he heard. Deal with it. 3) If your DM tells the group, "A frail figure hobbles toward you. It appears to be an old man that requires a cane to walk." and suddenly the DM whips out a Monster Manual... That does NOT mean your characters should be drawing their weapons. Why would they? Even if the old man truly does turn out to be a shapeshifting creature comprised of pokey things and hellish mandibles, that does NOT mean your characters have any clue other than seeing a poor old man stumbling around. I recommend all DMs pull this test on their group once and see how your players react. The best part is, you could just be looking through the Monster Manual for fun and the old man really turns out to be nothing more than what he appears to be. The biggest reason this term gets such a bad reputation is that it generally causes issues for the DM while also killing the immersion for the other players. So let's take a look at what can be done about it. How do I avoid Metagaming? It's a simple question you can always ask yourself in any situation where you can't make up your mind. What would my character do? If you instead thought I meant "what would Macaulay Caulkin do?" then you're beyond help. If you've created even a remotely fleshed out roleplaying character or even just a basic personality then you can typically figure out what your character would do in any given circumstance. These are already built into the game but not enough people seem to use them. Whenever a beastie shows up, the adventurers are allowed to roll a Knowledge Check to see how much their characters know about whatever strange abomination they get to face at that given moment. Knowledge Checks are cool and they save the environment. Some players just can't help but remember that a certain Monster is the same level they are and that everything is going to be A-okay if they face off against it. If this occurs then you should tweak your monsters more often. Change their level, their HP, their damage output, or just go the extra mile and give them abilities they normally wouldn't have. Maybe even make some of your own creatures that they've never even heard of and really throw them for a loop. The less the players know about the monsters they're facing, the less likely they'll be thinking about numbers since they can't metagame even by accident. The more often everyone stays in character, the more likely everyone is going to think in-character rather than out-of-character. I think this one is pretty self-explanatory. Too often the line of thought is: "If the creature exists in front of my character then the DM obviously thinks we can handle it." You have to break that mode of thought. This isn't a video game where all the enemies are tailored to your level and they just happen to scale up nonsensically for your benefit. Every once in awhile, just throw an Elder Dragon at them or some other horrifying thing that they can't help but realize it's futile. You can even give them a common sense check with a +50 to their roll that signals to their character: "This won't end well. Why aren't you running already?" Now, don't misunderstand me. I'm not saying to kill the poor bastards. I'm just saying that you need to make them afraid to rush into every situation or else they'll think they can overcome anything and not only will that kill the immersion but it manages to ruin the scope of the game and downplay any sense of bravery from roleplaying as they'll just keep the mindset of going "by the numbers". Speaking of doing things by the numbers... attempt to get rid of as many numbers as possible. The less math that's constantly displayed the better. This particular bit of advice can get a bit tricky in D&D due to character sheets and other issues so I'm going to save this topic for another day as it probably deserves its own post. Some groups just need that extra bit of help. If two characters are talking alone, then maybe they really should go somewhere else to have their discussion. As always, this is a case by case kind of scenario but it might be handy every once in awhile. Passing notes to the DM may also be helpful to hide character thoughts or ask if something is acceptable. Players can't accidentally metagame if they've never heard the conversation spoken between two characters. If a particular player has a bad case of the metagame-flu then a simple solution is to discuss it with them separately. Open communication helps solve a LOT of issues and this is no different. Let them know how you feel, ask them what they think, and try to generally solve the issue together. Before I end this article, I'd like to mention something I believe doesn't get enough attention. Metagaming doesn't need to have a negative connotation. Metagaming can be a bad thing but it can also be helpful or even necessary. Don't treat metagaming like a curse word and remember that it's a spectrum. This is Kylak signing out and using out of character knowledge to make on-site posts.